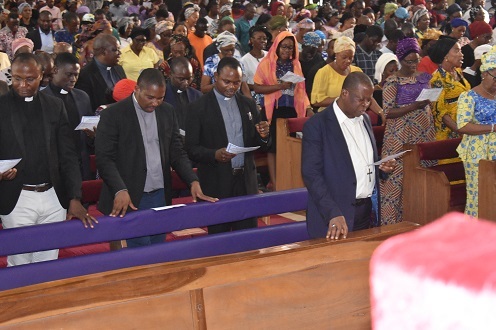 These were the words of the Executive Secretary of Nigeria Evangelical Missions Association (NEMA), Mike Adegbile on the day four of the 7-day Lenten Revival Programme tagged, “The Way of the Cross,” organized by the Abuja Anglican Diocese and held at the Cathedral Church of the Advent, Life Camp, Abuja. Speaking on the topic for day four, “A New and Living Hope,” the preacher explained that the death and resurrection of Jesus Christ brought about access and a new way of communing with God. He noted that before the coming of Jesus, there were restrictions in approaching God, because only the high priest could enter the place of atonement and only once in a year to make atonement for the sins of the people. He said the Ark of Covenant rested in the most holy place that was covered with a curtain and so, many could not view it. He however expressed joy that this barrier has been broken with the death of Jesus Christ, giving room for intimacy with God and the privilege for man to come boldly to the throne of grace. Mr. Adegbile said man was created for communion with God, to give God pleasure and to fulfill His purpose on earth. But, according to him, sin separated man from God and that is why Christ came to restore that broken relationship. He said the body of Jesus was broken and His blood shed to give man the privilege to become children of God; adding that a new way has been consecrated by the body of Jesus Christ. He pointed out that man now has unhindered access to the throne of God and the privilege to carry every issue to God in prayer. Thus, he encouraged all present to avail themselves of this free access to God and walk intimately with Him. He thanked God for the ministry of Priesthood, emphasizing that though they play a vital role towards taking care of the body of Christ, every individual has equal access and right of entry by the blood of Jesus into the throne of grace. He however expressed dissatisfaction that many do not take advantage of this access, and therefore urged all to start to do so. The guest preacher observed that many members of the Church are visitors to the secret place, instead of being people who dwell in the secret place of the Most High. According to him, just as satan attacked Adam’s relationship with God, he is doing the same today through the hustle and bustle of life. He opined that needs are not meant to control the life of a Christian; adding that a believer ought to seek God first and all other things shall be added to him or her. “There is need to reorder our priorities,” he said; stating that God is not the number one for many Christians today. He pointed out that what makes a person stand out and a wonder to others is a person’s intimacy with God. He opined that even if one is satisfied with a casual experience with God that is not God’s desire for His people, because according to him, God desires an abiding experience, one that is not just for the week, but for the rest of life’s journey. Mr. Mike Adegbile stated that discipline is required in one’s pursuit of God and therefore one must pray for the grace to be consistent in one’s walk with God and spend time communing with God daily. 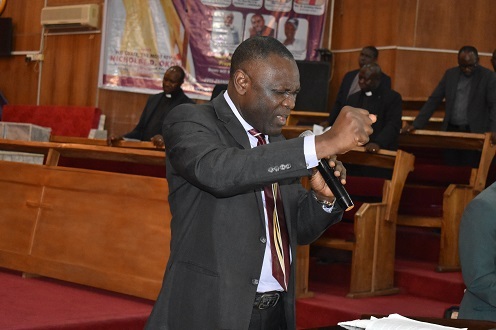 The Executive Secretary of Nigeria Evangelical Missions Association (NEMA) said the way of the cross is a way where all flesh is crucified; adding that Christianity should be understood as a call to die to self. He stressed that the Christian life is in grateful responsibility to that cross, which is the symbol of Jesus’ suffering, man’s redemption and salvation; explaining that the cross stands at the centre of the Christian faith. He concluded that the resurrection of Jesus gives hope to followers of Christ and the fact that He is the High Priest is a living hope to all who believe in His name. 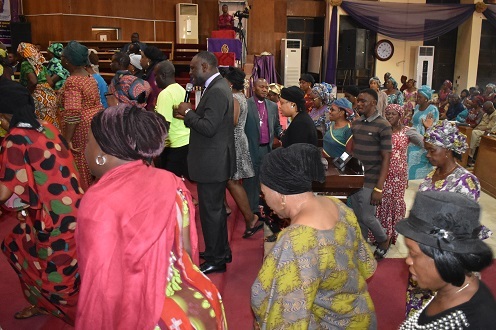 The Revival service ended powerfully with specific prayers said by the guest preacher to address certain issues in the lives of some attendees of the programme. After which the Primate of all Nigeria Anglican Communion, The Most Rev. 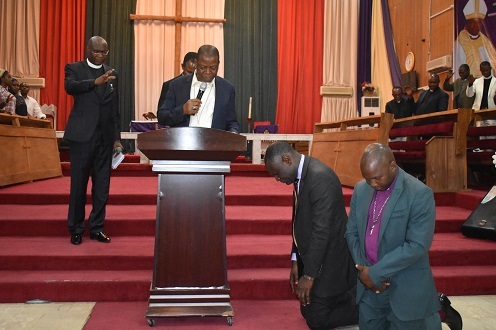 Nicholas D. Okoh led the prayers for the preacher.